JoLida has been in business as a manufacturer and supplier of various electronic parts since 1983. In 1995, they had designed and built a large transformer to a customer's specification that was determined to be an excellent transformer for hi fi use, in a smaller size. Although they had a great transformer, JoLida decided to shun the "high end" market: they felt the world was overcrowded in the high end arena and did not need another $3000 amp. Consider this for a few moments, if you will: at a retail price of $3000 for an amplifier, it really isn't any great feat to build an excellent amplifier. What if you want to build a high quality tube amp priced under a kilobuck, and market it directly towards the mid fi sector? That's a bit harder to accomplish, right? Well, that's exactly what Mike Allen, Fearless Leader of JoLida, has done. Now there is no excuse for owning substandard audio equipment. Excellent high quality audio equipment is now affordable for the masses. The JD-302B is a very well built unit, weighing in at approximately 39 pounds. Sprouting from its matte black top panel are pair of 12AX7 preamp tubes, a pair of 12AT7 driver tubes, and a quartet of EL34 output tubes. All of the tubes are of Chinese manufacture. The champagne finished front panel has controls for volume, balance, input selection, and power. True simplicity. The rear panel exhibits excellent design on JoLida's part: the gold plated RCA jacks are spaced wide enough from each other to accept any type of high end cables imaginable. The power cord plugs into an IEC jack, should one decide to experiment with different types of power cord, and the 5 way gold plated binding posts are quite sturdy. The JD-302B is covered by a 3 year parts and labor warranty. The tubes are covered for 6 months. The life expectancy of the tubes is approximately 6 years. Replacement tubes are reasonably priced and readily available from a number of different sources when required. All JoLida electronics are assembled in China, with final assembly at the JoLida factory in Maryland. Upon completion, all JoLida components are burned in for 48 hours, inspected again, and boxed for shipment. As you can already tell, this is a positive review. However, I don't feel that I can properly convey my skepticism when the unit was originally offered. I came to review the JD-302B in a very "round about" way. My trusty, reliable and much loved Harman/Kardon CD player had died a couple of years ago, after many years of heavy use. I had replaced it with a Sony ES series player, which I never liked. After my review of the Van Alstine Super PAS 3 preamplifier, I had become very interested in vacuum tubes, after a hiatus of some twenty years. Mike agreed to ship a review sample on the condition that I also accept the JD-302B, and, while I was at it, was I interested in reviewing his new speaker? I really wasn't interested in the amp or the speakers at all, but I really wanted to try the CD player, so I agreed. After all, the amp is "only" 50 watts per channel, and don't all "real" tube amps cost some serious coin? How good could the amp really sound? It doesn't cost enough to be good. To say that the JD-302B realigned my personal "Cost vs. Performance" ratio is an extreme understatement. Due to the fact that the amp had already been burned in at the factory, I didn't have to suffer through the "Burn In Blues". Setup was easy: open the box, remove the amp, and insert the vacuum tubes into the proper sockets. Then, if you want to, bias the output tubes. This is not absolutely necessary, as the tubes were biased during the burn in cycle at the factory. Nonetheless, tube biasing is fast and easy. I had never done it before, and the first time took me twenty minutes, half of that being reading the instructions. I did experience a small snag while biasing the tubes. The instructions called for biasing the EL-34's at 40mv plus or minus 4 mV. Try as much I could I couldn't even get one of the tubes to 40 mV; all I could accomplish was 38mv. The other 3 tubes were not a problem. I will stress that regardless of this "problem", the amp sounded fine. The folks at Svetlana were nice enough to loan me a matched quartet of EL34 tubes, which I substituted in place of the original tubes upon their arrival.. The Svetlanas were biased at 40mv and remained in place for the remainder of the review. I won't elaborate farther on the Svetlanas, except to say that the bass was a bit more extended. For more details, I will refer you to Geoff Husband's review of the Svetlana EL34 and concur with him that they are inexpensive enough to buy with the amp, and use the JoLida supplied tubes as spares. JoLida themselves offer the Svetlanas as a factory option, at a very modest additional charge. The Hi Fi Reviewers "job" can be a tough lot. The upside? Getting to borrow gear from various manufacturers and (hopefully) enjoy them at home. The downside? Good gear has gotten so good that it the difference in equipment mainly comes down to the details. That's the problem: determining the differences and trying to put them into words is usually very difficult. I had a much different "problem" with the JD-302B: I kept forgetting to review it. It happened regularly: I would get some time alone at home, sit down to listen to some music, and promptly forget to "review". I ended up enjoying music for music's sake each and every time. I will say that the sound was very natural, and definitely on the "warm" side, which I found out that I enjoyed immensely. It performed flawlessly with most every type of music that I threw at it. I even found out that I could easily live with "only" 50 watts per channel, although I could make it run out of steam: Jimi Hendrix's " Red House" begs to be played very loudly, and is my "High Volume Acid Test". The overall sound of the amp, for want of a better terms, is relaxed and luxurious. The mids and the highs were some of the best I have ever heard, regardless of price. Compared to the large solid state amp that had made it's home in my system, I heard far more "texture" with the JoLida than I was used to. Texture is a good thing! The amp seemed to be able to convey more of the music's emotion than my usual amp. To use another analogy, think for a moment of eating spicy food. Some spicy food just seems to be damn hot, but with no real flavor. Other foods, while spicy, also let through other flavors, without assaulting your mouth with nothing but spice. For want of a better comparison, my high powered amp seems like the first example, very fast, very analytical, but no real flavor. The JoLida on the other hand, had loads of flavor and was a pure joy to listen to. Another major difference over any other amp that I have either owned or auditioned with the JD-302B: low level listening. Even at the very lowest levels imaginable, I could hear all of the bass, and the clarity across the audio spectrum was outstanding. Even at levels low enough to permit a quiet conversation with my wife, I could hear all of the music, all of the time. Speaking of my wife, the JD-302B also got the highest (and maybe only) accolades of any component that I have reviewed. She is very sensitive to music played at even "moderate" volume levels, and really enjoyed the fact that I didn't have to increase the gain to hear everything. Both of us also enjoyed the ambience created by watching the glow of the tubes in a darkened room. It was both very relaxing and very beautiful. Is the JD-302B the perfect amp? Sorry folks, there is no such thing as the perfect amp. I do have a couple of complaints about the JD-302B. I really missed the bottom end heft and control that I am accustomed to with a high powered solid state amp. Depending on the recording, the bottom end can sound a bit "soft" and a bit "loose". Mike explained that this is a characteristic of any amplifier using EL34 output tubes. It seems that the EL34 was originally designed in England, where listening rooms, and speakers tend to be smaller than here in the U.S. He suggested that I might like the SJ-502B better. It's 6550 based (or KT-88's can be substituted) and it's approximately $200 more than the JD-302B. Apparently, the 6650's and KT-88's were designed in the U.S. for larger rooms and speakers (as well as slightly higher output). If I had smaller speakers (I have large floor standing Infinity towers) I would probably not have even noticed the JD-302B's tendency towards politeness in the lower registers. In all fairness, the amp will accommodate an external powered subwoofer, for more grunt, but I don't have one on hand. Again, please keep in mind, the amp retails for a shade over $900, while my "usual" amp/preamp combo retails for over double that. This amp more than held its own. Overall, it won the fight. I also wish the JoLida amps had a headphone jack. I listen to music very occasionally through headphones, but somehow I really miss it when the option of headphone listening becomes unavailable. Mike was very deliberate in omitting a headphone jack. He feels that irresponsible use of headphones leads to hearing loss. While I wholeheartedly agree with him, I still missed having the capability. Also, the amp does not have a phono preamp. Mike states that most of his buyers are not into vinyl. Adding a phono preamp would have added approximately $200 to the cost, and Mike didn't think it fair to penalize those who don't play LP's. Fair enough. 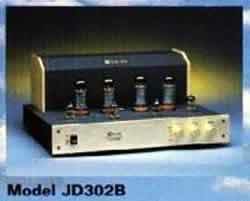 Of course, an outboard phono preamp can used with the JD-302B for those who require it. Does the JD-302B produce the best bass I have ever heard? No. The best high end? Close. Is it the "Best" amp I have ever heard? No. Have I ever had more fun while listening to music? Definitely not. In fact, did I forget about the system and just enjoy the music? YES!!!!! Isn't that the point of owning a system in the first place? Very highly recommended.